If you haven’t read director Alex Proyas’ tirade on film critics on his public Facebook page, we honestly recommend doing so, because it’s a fascinating read. The short version of it is basically “film critics are stupid hacks, they don’t know true art if it hit them in the face”, and all because virtually the entire world turned against his latest film Gods of Egypt, which currently sits at 15% on Rotten Tomatoes and is an official box office flop, just barely making back its $140 million budget worldwide. As a film review website, we find Proyas’ rant to be nothing more than a temper tantrum from a privileged child that is given a rather costly Lego set, builds something pretty tacky out of it, and is in denial about having built is something that does not justify the cost of the set. The harsh reality is, of course, that Gods of Egypt really is a terrible film, and Proyas – despite having worked on films like The Crow, Dark City and I, Robot in the past – needs to accept the fact that the critics are actually helping him understand this instead of being the “diseased vultures” he claims them to be, because vultures are naturally inclined to circle around deceased animals. A movie so dumb it actually shows the planet as being flat, the movie takes place in the whitest of Egyptian kingdoms, where giant oversized gods – in one of the many laughably awful instances of visual effects – live amongst the normal-heighted “mortals” as royalty, apparently having gotten rid of all the Pharaohs that ever existed. One such god, Horus (Nikolaj Coster-Waldau), is one day overpowered by his evil uncle, god of darkness Set (a bearded Gerard Butler, still thinking and looking like he’s on the set of 300), who takes away his eyes and assumes command over all the mortals, including thief Bek (Brenton Thwaites) and his lady-love Zaya (Courtney Eaton). Bek soon comes to Horus in the wake of a personal loss, and together this mismatched pair must journey across the Egyptian kingdom for some convoluted reason to restore order and dethrone that dastardly Set. Like the most memorable of bad movies, this is one that gets pretty much everything wrong. 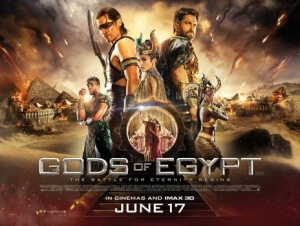 The fact that the majority of the Egyptian characters are played by white actors, a topic subject to heated controversy, is honestly the least of its problems; it also suffers greatly from an excessive overload of terrible CGI which makes even the tiniest details like backgrounds or even characters’ bodies look like it came out of an early-generation PS2 game, and because the film is packed to the brim with them you’ll be forgiven for mistaking this for a very poorly-rendered cartoon instead of whatever the hell it actually thinks it is. The script is no better, filled with expository dialogue and smug attempts to inject a bit of fun into its veins, with the most stock bunch of characters occupying it at every turn with no hint of subtlety or effort to make them the least bit interesting. Appropriate, then, that the actors all give performances that match the half-assed nature of this script, though that may be down to how they’re filming in front of such obvious green-screen that even they have no idea what it is they’re making. Aside from Butler just doing his King Leonidas shtick again, beard and all, you have Geoffrey Rush looking especially confused as Ra himself driving a sun-pulling boat in space (it happens), Thwaites being a rather obnoxious good-looking hero type, Chadwick Boseman being especially awful as an all-but-useless comic relief god of wisdom who seems to be counting down the seconds until he starts playing Black Panther, and everyone else including the usually-charismatic Coster-Waldau barely registering in roles where even they can’t give much of a crap about what’s going on. Like we said, pretty much everything in this movie is a complete and utter failure – but to be fair, it’s kind of funny how much of a complete and utter failure it is. Whether or not you’ll find it all to be a delightfully bad viewing experience is entirely down to your personal tastes, and we will completely sympathise with you for not even seeing it as a so-bad-it’s-good flick, but for our money many of the decisions that went in to making this undeniable turd, regardless of whether any of them were Proyas’ call in the first place, are so laughably bad that it’s almost worth checking out as part of an ironic movie night with a bunch of your friends. You’ll get chuckles from how fake the effects look, particularly some early reveals of the height difference between gods and mortals, some unintentional giggles from some of the underacting or overacting the performers give (one Butler scream is particularly funny), and become so baffled by the complete nonsense going on in this script and dialogue that you have no choice but to laugh, which doesn’t get any better than this gem: “I will take your place, but it won’t be sitting on some damn boat!”. If you’re just looking for something to laugh at, then Gods of Egypt is definitely worth your time. So Mr. Proyas, you can harp on all you want about us film critics, but at the end of the day it wasn’t us who made the rubbish movie to begin with. Gods of Egypt is undeniably terrible, with everything from the poor effects to the dumb script to the terrible performances making it an utter failure, but its shortcomings can make for an unintentionally hilarious sitting for lovers of bad movie everywhere.